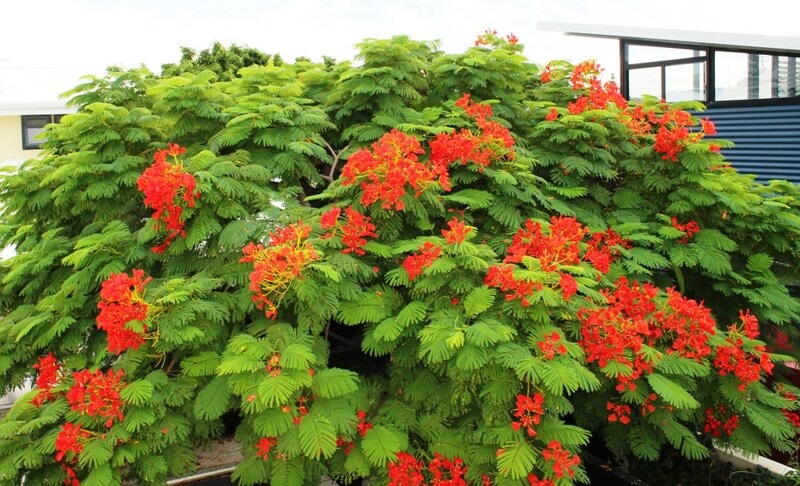 When the Poinciana tree in my courtyard is viewed from the upstairs window one can imagine that it is early summer, as the canopy is a lush green and is festooned with gorgeous red blooms. But, down below it is a different story as thousands (if not millions) of the tiny yellow leaves rain down on almost every inch of the courtyard. The flush of autumn flowers means that there are also lots of red petals in the mix. The leaves not only blanket the paving but they also tend to get into every little crevice where they can create problems. 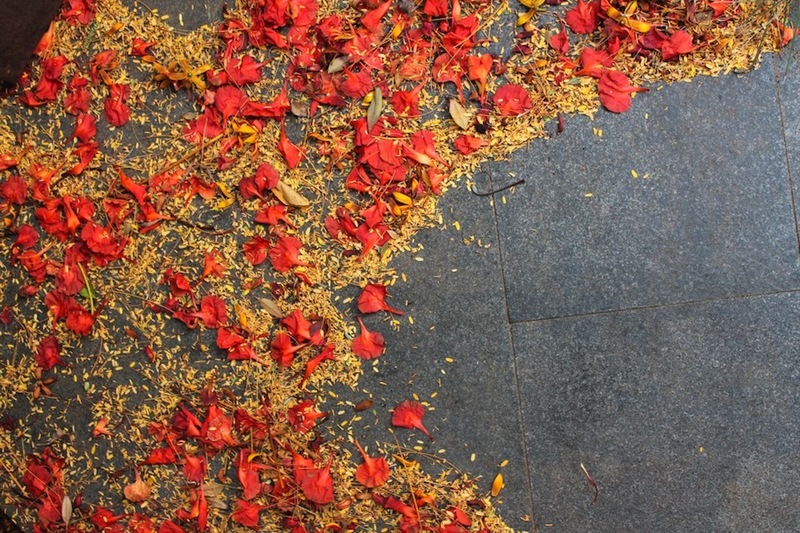 As the days shorten and the weather cools, the showers of leaves will turn into a deluge which will quickly block drains, clog up the gaps in the decking and fill the spaces between the pebbles making them look less attractive. In fact it was when I used pebbles to mulch some of the garden beds that I decided I needed a blower. 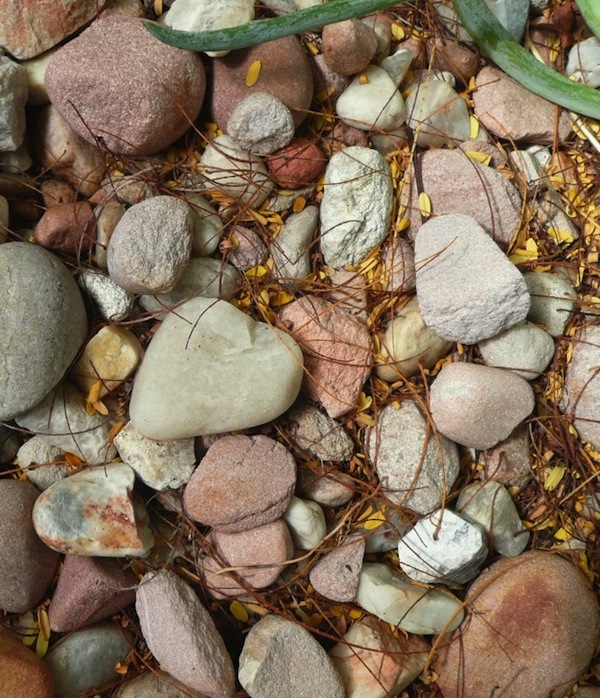 Leaf litter is perhaps to be encouraged when you are trying to recreate a naturalistic dry creek bed but in a contemporary garden, the pebbles look better if they are clean and fresh. The Poinciana leaves break down quickly and can soon smother the pebbles. They also settle on outdoor furniture and find their way into the BBQ, even when the lid is down. This is where my trusty Ryobi blower comes into play. 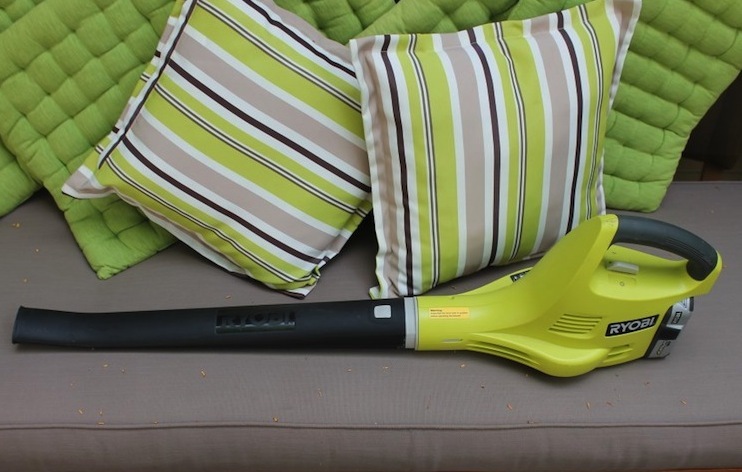 It easily blows the leaves off of tables, chairs and cushions without touching the surface so there is no transfer of dirt as could be the case with a broom. 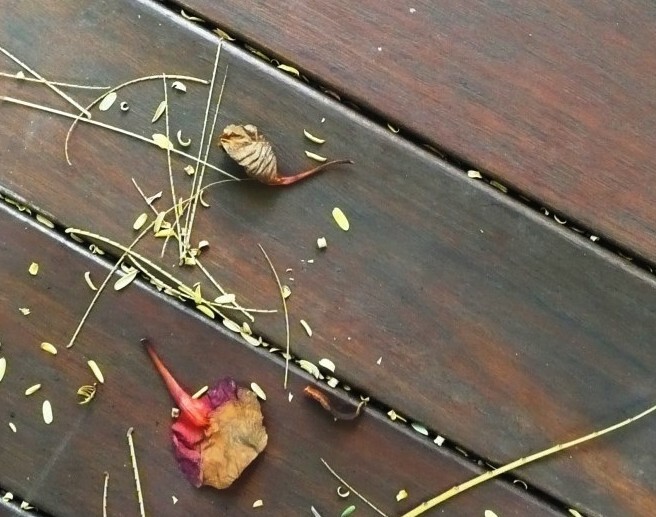 It blows the leaves out of the gaps in the decking with virtually one pass and the leaves are blown out of the pebble mulch with very little disturbance of the pebbles. It also removes the leaves and dust from the paving very efficiently. The way I use the blower is to start on the tall surfaces like the BBQ bench and table and then work my way down to the paving. Then it is like shepherding the leaves into a pile so that they can be picked up. I use the word shepherding because the process is like a sheep dog herding sheep. If a little gust of leaves makes a break for it I dash around to head them off and send them back into the flock. When I’m in a hurry I’m sure it looks quite comical as I dance around redirecting the strays. I always try to remove the leaves if rain is imminent. The main reason for this is that leaves left on the paving will be washed into the drain, possibly causing a blockage when they accumulate. Any leaves that aren’t washed away are difficult to remove while they are wet with either the blower or a broom. The Ryobi is powered by a rechargeable battery and is very light weight and therefore easy to use. It does take a little bit of practice to direct the leaves where you want them to go but if you make a mistake and blast them all over the place, it only takes a few seconds to redo it. The long slim nozzle makes it very manoeuvrable so that you can direct the airflow behind pots, between chair legs and under tables without having to move them. Thankfully it is no louder than a vacuum cleaner which a lot quieter than most blower vacs. I don’t think that the model I use would be suitable for large gardens because the battery would need to be recharged part way through the job but it is ideal for my courtyard, keeping it clean despite the constant showers of falling leaves in autumn. A hailstorm one year on – how do you recover? Thanks for the review, I have a corded blower/vac which is so loud almost unusable – have other Ryobi + one products which are great – nice to see this blower is much quieter. Thanks Kevin – yes, noise was the main reason that I didn’t use our blower/vac (and the fact that it was very cumbersome). I was happy to forego the vacuum function for the other advantages. Using a dustpan and brush is ultra quiet! We have a magnolia tree in our courtyard which we adore but she is high. maintenance. So after years of sweep and scoop we bought a royobi vac and blower. Took a bit of getting used to but now we have this process – sweep into a narrow line and vac up the leaves etc. As it vacs it also chews reducing the collection for a mulch. To the mulch we add some fertiliser, wet and stir occasionally and then return to the garden. Win win all round. I think it will help me decide to purchase this blower over others i have considered. Ryobi leaf blower looks pretty handy. I also always prefer to look for leaf blowers that are cordless. I truly appreciate this article.Much thanks again. Keep writing.